Animal antics, Art, Museums, Paris, je t'adore!, Restaurants - let's eat chic, Travel - bon voyage!, Vive la France! When I was a child, we always had prints of famous paintings on various of the walls at home. It’s little wonder I grew up with a taste for things French (including a certain man), because most of these prints were of works by French painters – from Chardin to Lautrec. 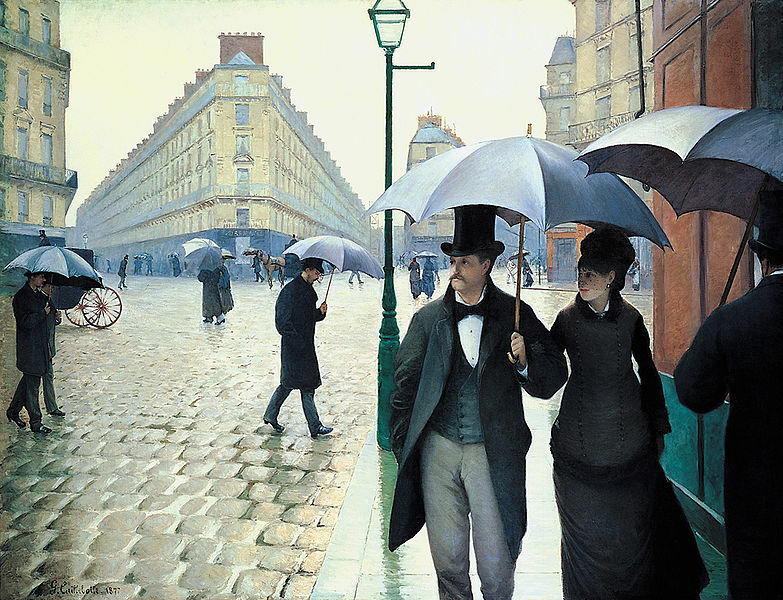 One of my favourites was the depiction of a nineteenth century couple walking along a Paris street in the rain. The man holds up a large black umbrella to shield the pair against the downpour and the streets are cobbled in that tell-tale European way, evoking daydreams of times of yore. I always loved looking at a particular building in the background, which is shaped like a piece of pie, the point of which is aimed directly at the viewer. “Why would an architect make a building that shape?” I’d ask, “To fit the parcel of land, I suppose, but it’s not very practical. How on earth would you furnish the triangular rooms in the point?” No one ever had an answer for me, but it didn’t matter one jot. I loved that painting regardless of the fact that I didn’t understand the reasoning behind triangular buildings, or why the beautiful woman wears black. Had she and her husband been to a funeral? Or perhaps were they in mourning? Regardless, as an artistic device their sombre clothes match well the drizzle of the day. Yes, it was likely that they were sad about something and that gave me yet another mystery to ponder. Gustave Caillebotte was the artist responsible for this work, named ‘Rue de Paris; temps de pluie’, or ‘Rainy Day in Paris’, the original of which now hangs in the Art Institute of Chicago. Those In The Know refer to Caillebotte as an impressionist, yet there’s a realism in his work that the Seurats and Monets lack. Caillebotte’s paintings are like snapshots of the époque in which he lived. You could almost walk into them, they’re so lifelike. 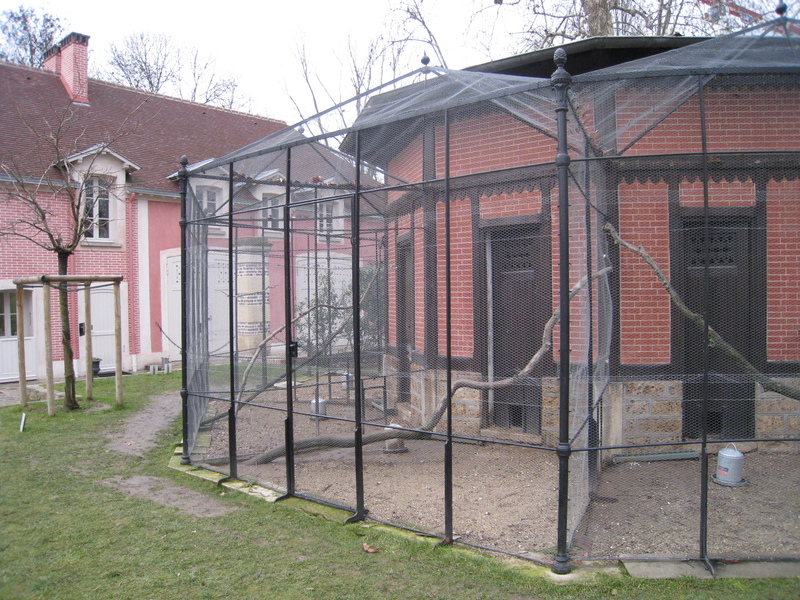 Given my interest in Caillebotte you can imagine my excitement when Monsieur’s Maman suggested lunch at the Parc Caillebotte in Yerres. Caillebotte had been born into a well-to-do Parisian family that spent many of their summers at the family property in Yerres, a small town on the Yerres River, to the south of Paris. 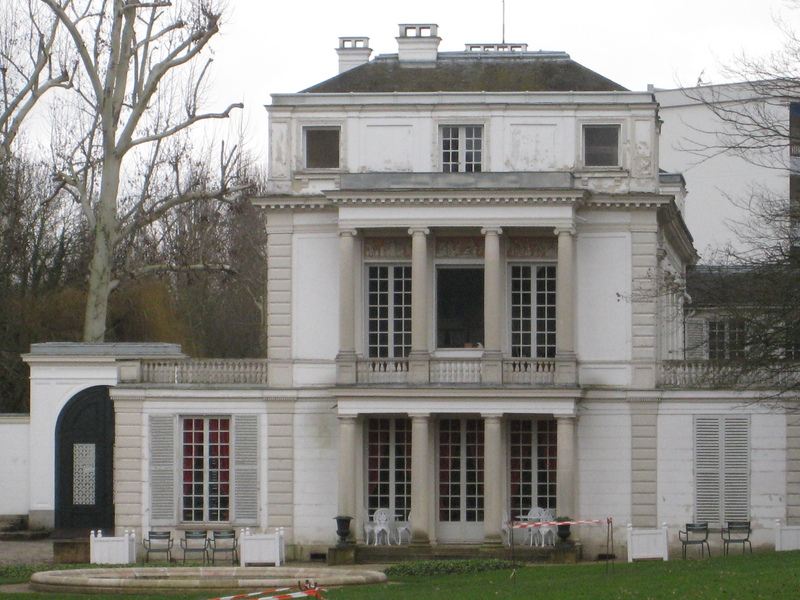 This property has been named Parc Caillebotte for its former owners and appears in various of Caillebotte’s paintings, such as Les Oragers (The Orange Trees). The ‘Mairie’, or Mayor’s office, for Yerres has invested much time and effort in restoring the Parc to create a leisure destination which successfully blends culture, relaxation, and natural beauty, whilst celebrating the work of its famous son. Sadly, it was a grey February day when we made our visit to the Parc, but that didn’t detract from its interest. 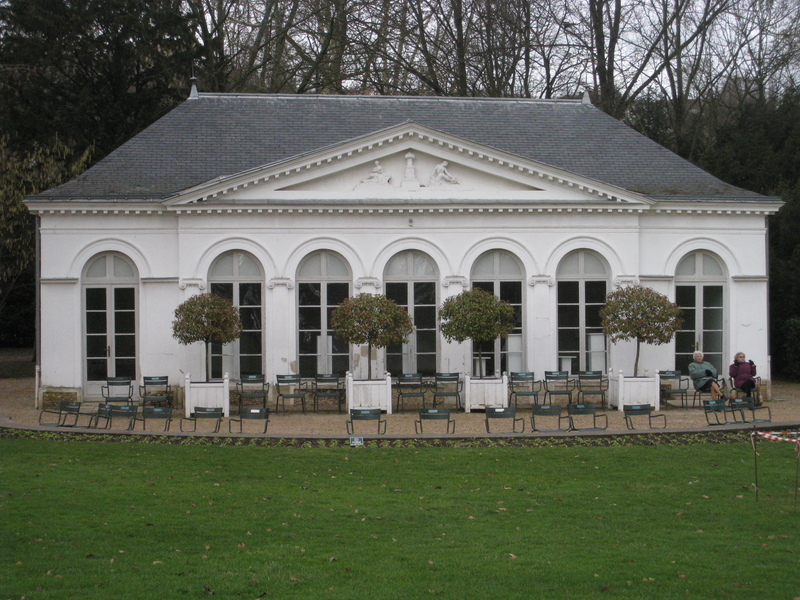 The large, white Caillebotte family house known as ‘le Casin’ stands proud at the entrance to the Parc. It is home to two permanent exhibitions, but was closed when we visited. Outside, there are various buildings of different styles and purposes dotted around the grounds, like the funny little pagoda atop a rockery with grotto beneath. This was also closed but in the summer months it serves as a refreshments kiosk. On a day like this, there was little need for a bottle of something refreshing. The weather was fresh enough. 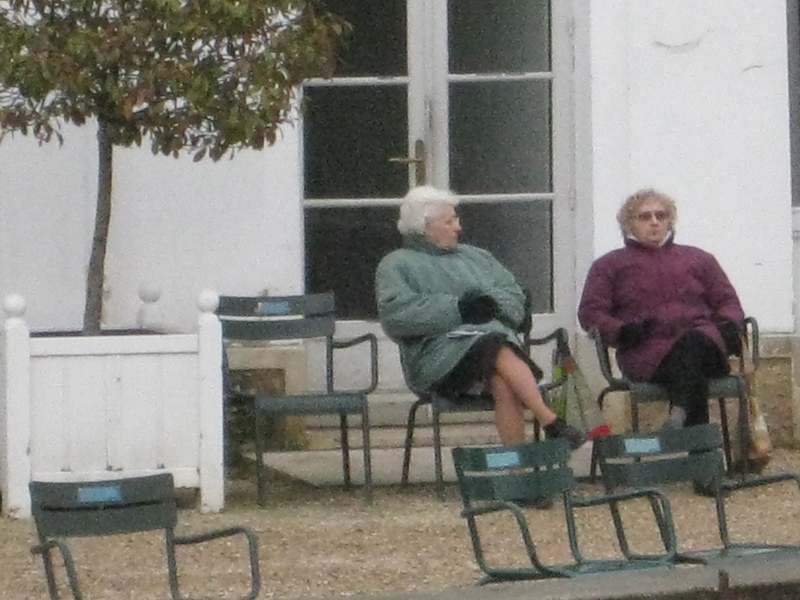 Down by the river, there’s a long, white orangery with outdoor seats, where a couple of local dames sat and gossiped, quite oblivious to the chill in the air. Monsieur’s Maman told us that further afield lay a chapel and vegetable garden, but we all agreed that, on this occasion, it was too cold to hang about and explore. Warm interiors beckoned. At the Parc I did, however, talk to the animals again. There are hens of all descriptions and a pair of flopsy white rabbits in a large chicken coop behind the Parc’s restaurant, Chalet du Parc, so I clucked at them and they clucked back and Monsieur’s Maman must then have realised that her son is marrying a madwoman. As for Monsieur, well, he’s just used to it. His ears are now deaf to my clucking sounds. 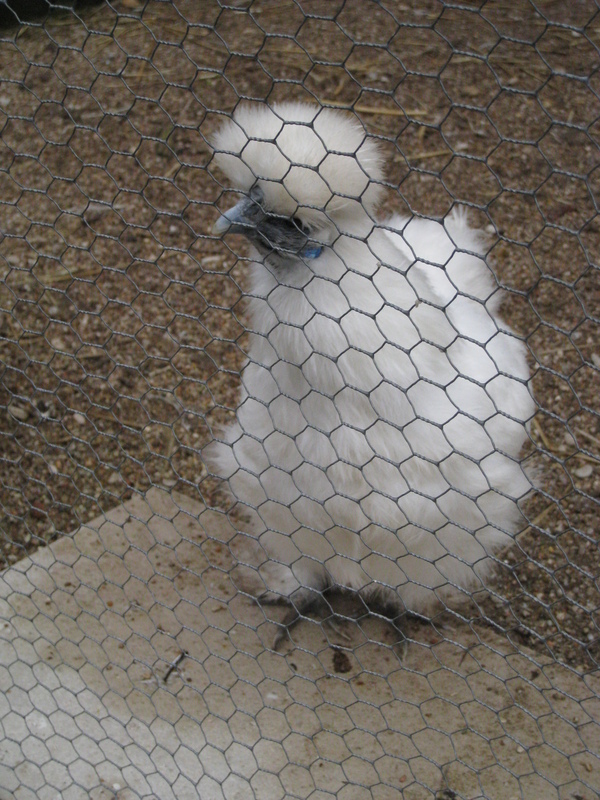 I loved these cotton wool hens with their little blue faces. And so did the four year-old next to me! One day, when the sun shines and the arctic air has gone, I hope we will all return to the Parc Caillebotte. There are the exhibitions to see, naturally, but on the Halcyon day that I imagine, we won’t want to linger indoors. We’ll buy cold drinks at the Pagoda kiosk, picnic on the broad lawn and then perhaps rent a couple of canoes to paddle up and down the river, just like the man in Caillebotte’s painting, ‘Les Périssoires sur l’Yerres’ (‘Oarsmen on the Yerres). To that day I do look forward, very much indeed, but first I should really tell you all about LUNCH. Next Post Show me your Tequila Face! Sometimes it’s nice to visit places out of season … and sometimes it isn’t. I always want to see the insides of those pie shaped building. There’s a hotel in Yokohama that’s V-shaped like a ship that I would really like to go exploring in … just to see what’s what. PR – If you check out the pie in Yokohama, I’ll check out the pie in Paris (it’s a bit closer for me) and then we can compare notes. There’s also that other pie in New York – the Gridiron Building. Whichever one of us gets there first will have to check that one out. 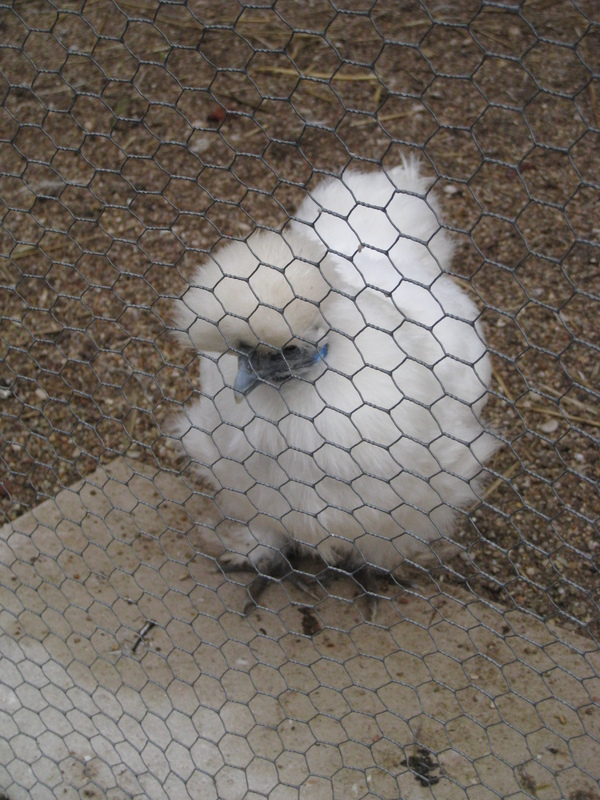 Oh, I’ve never seen a cotton hen with the blue face! The 4 year old loved it and now the 65 year old! This is a lovely post, Epic. Lovely. Gustave Caillebotte’s treament of the water in between the paving stones is fabulous. I saw the Seurat (A Sunday on La Grande Jatte)at the Art Institute of Chicago and I was amazed at how big it was, but unfortunately I didn’t know about Caillebotte back then, so I don’t remember seeing any of his work. 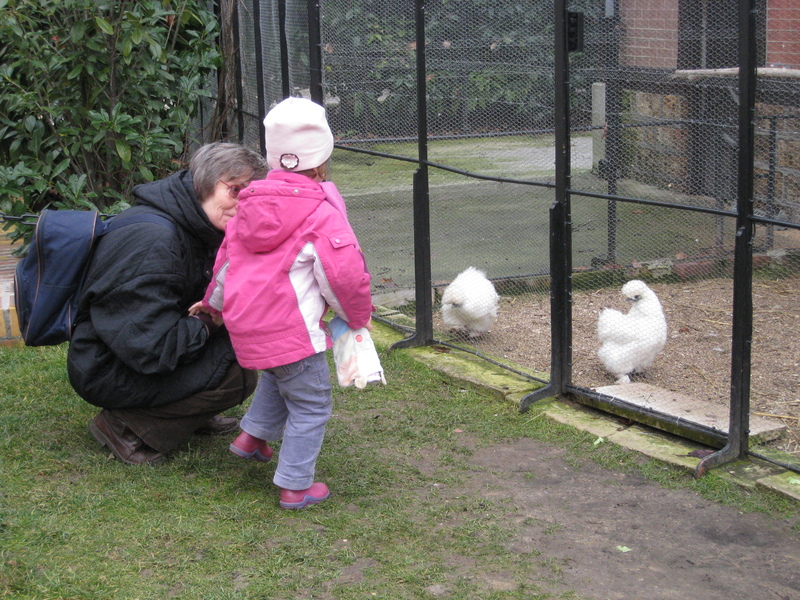 As for the little fluffball chickens, I couldn’t help but wonder….. what they taste like. Hi Razz! Have you missed me? Well you can stop that now because I am back and will soon be back in your (smiley) face. RE: that Seurat, Dad has seen it on a business trip to Chicago and said it really took his breath away. We have a smaller Seurat at the National Gallery here, The Bathers at Asnieres. It’s not as intricate as La Grande Jatte though. That one can keep the eye amused for ages – just like a Where’s Wally Now book. And although I will now upset vegetarians everywhere (and possibly Pat), yes, I too wondered how best to roast those little fluffball chickens. Aren’t we horrible? I am a cousin of Gustave and looking for some updated photos of the old property. My grandfather’s line of de Launay’s are the only Caillebotte American cousins we think, but we’re still looking. Thank you for posting your pics and story. I’m waiting for warmer weather to visit Yerres in Spring ’11. You might like to check it out – there are more photos of the property there under the Culture page. Please do let me know when you’ve been to Yerres and how you found it! I’ve finally made contact with Silvia Brame of the Brame and Lorenceau Gallery, and a sitting member of “le Comité Gustave Caillebotte”. I’m looking forward to meeting my cousin Gilles Chardeau soon, a descendant of Martial Caillebotte, and also a sitting member of the Comité. I will be in Paris on the 18th for one day. Hopefully his schedule will allow a short visit. Should you wish to stay up with what is going on, you can follow me at <a href="www.MyFamilyJules.com" title="My Family Jules". Okay, I’m a little rusty. Let me try it again. I thought I had the “closed” tag, but apparently not.